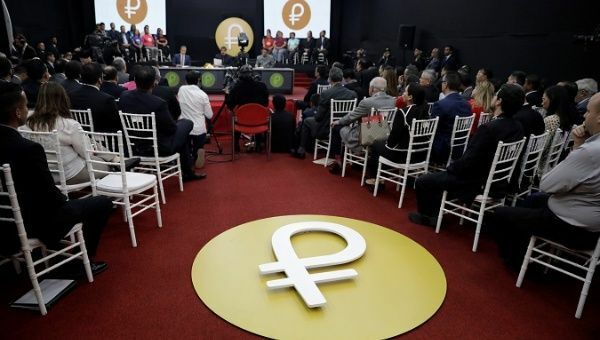 April 9 (teleSUR) U.S. President Donald Trump’s ban on the Venezuelan oil-backed Petro cryptocurrency was free publicity for the cryptocurrency and even helped it double the number of interest investors, according to the executive secretary for Venezuela’s Blockchain Observatory, Daniel Peña . In an interview with Venezuelan weekly newspaper Cuatro F, Daniel Peña spoke about the future of the cryptocurreny, a government strategy designed to circumvent U.S. sanctions and an international economic war against the Boliviarian country. On March, Trump’s government issued a decree banning transactions related to any Venezuelan cryptocurrency within the United States. “All transactions related to, provision of financing for, and other dealings in, by a United States person or within the United States, any digital currency, digital coin, or digital token, that was issued by, for, or on behalf of the Government of Venezuela on or after January 9, 2018, are prohibited as of the effective date of this order,” the decree stated. But apparently, the decision backfired. “It’s been a couple of days and the interest on Petro has doubled. If before we had about 400 clients each day, after Trump’s prohibition we have now 800 interested. Without any doubt, it’s been a necessary evil,” Pena argued. He also assured that the economic benefits of the Petro will begin to show in three to six months, despite attacks from the international finance system. The Petro started its sale period on March 22 and all state-owned companies are required to accept it in their transactions. Soon, real state companies will also be required to do so. When asked about the difference between using the Petro and regular Bolivares, Peña said there are many advantages in using the cryptocurrency. “Among them is breaking with the inflationary scheme of the Venezuelan economy… The intermediaries will disappear, it will be a directional purchase. The waiting time for transactions will be reduced, because it will be faster than the banking system,” he said. Shortly after opening the Petro for slae last month, President Nicolas Maduro spoke about the first days of Petro in the market, and criticized those who are attacking the Bolivarian government. “I demand respect from the world. We’re not messing up with other country’s financial initiatives, regardless of their economic power. Why would Venezuela be harassed for trying to create a financing source for its development, happines, peace and economic growth?” said President Maduro.